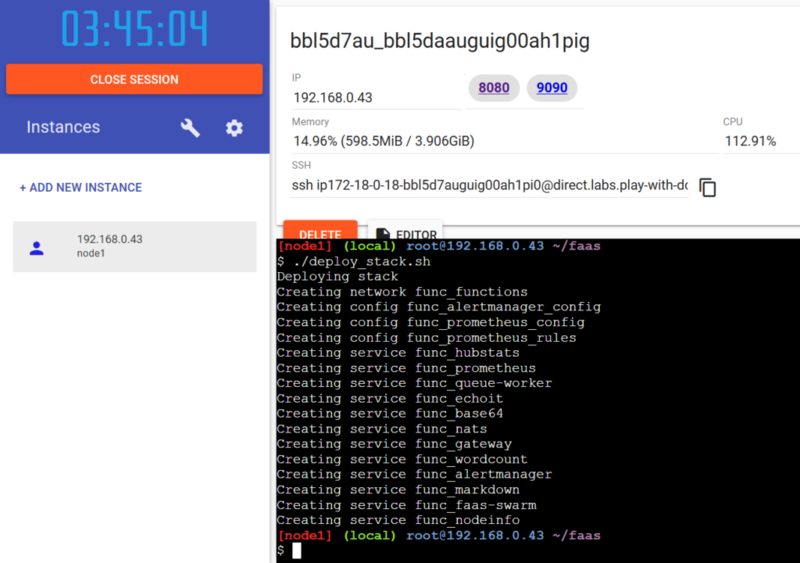 Home » Blog » Learning » Play with Docker, OpenFaaS, .NET Core, and Grafana! Play with Docker, OpenFaaS, .NET Core, and Grafana! 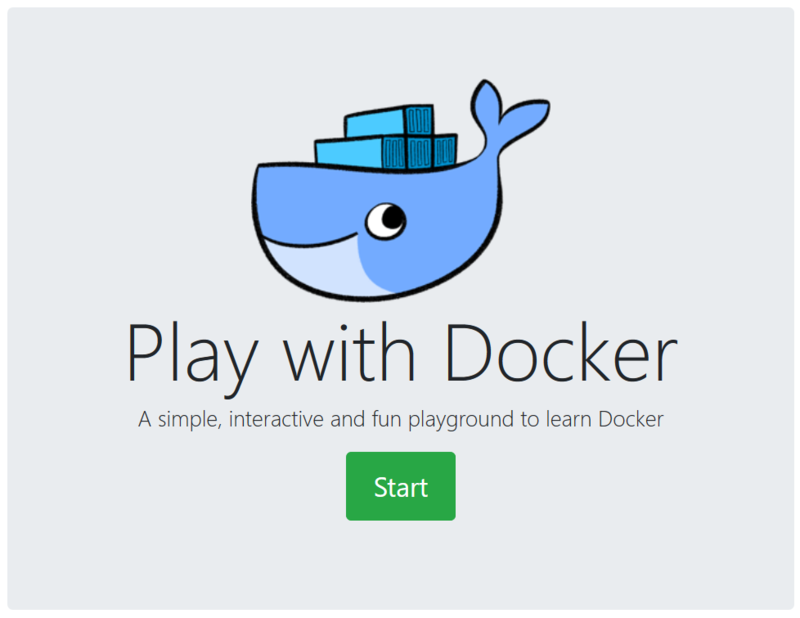 Play with Docker is a project by Marcos Liljedhal and Jonathan Leibiusky and sponsored by Docker. Play with Docker (PWD) allows the user to spin up Docker containers to play with and to prove out concepts. 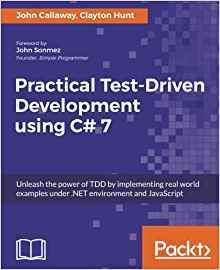 They also provide some training material that may prove useful if you’re new to Docker. Let’s get started by going to https://labs.play-with-docker.com. Start a new by logging in using your Docker account. If you don’t already have one you’ll need to create a new account to get started. You may either choose to Add New Instance or click on the wrench and select 3 Managers and 2 Workers from the modal to get started. We’ll be using Docker Swarm as the container orchestration for OpenFaaS. Kubernetes is another popular choice for container orchestration and works well with OpenFaaS. That’s outside of the scope for this blog post, but perhaps there will be a follow up post using Kubernetes if there’s enough interest. Now we’re going to get and deploy OpenFaaS. OpenFaaS is a framework for building serverless functions with Docker and Kubernetes. It has first class support for metrics, which we’ll explore a little bit. Any process can be packaged as a function enabling you to consume a range of web events without repetitive boiler-plate coding. Clone the faas repository from GitHub and deploy the OpenFaaS stack using the commands below. You should now see two links, 8080 and 9090 near the top-center of the page. These are links to the OpenFaaS Portal and Prometheus instance, respectively. You can read more about these and more at the docs site on http://docs.openfaas.com. Open the OpenFaaS Portal by clicking on the 8080 link. 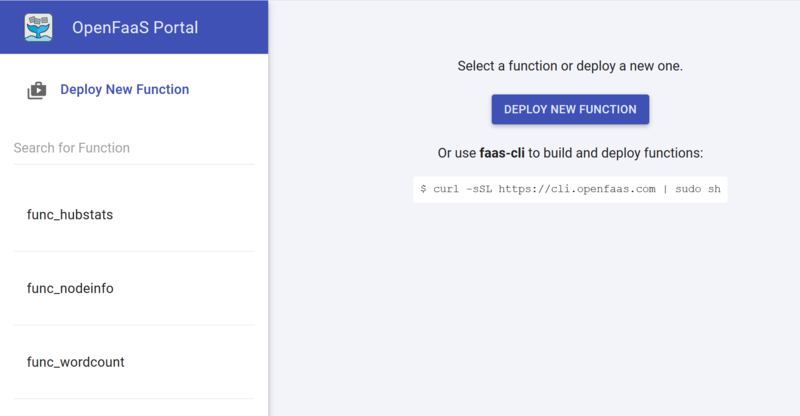 From here you can invoke any of the functions that are deployed for you by default, deploy new functions from the OpenFaaS store, or manually deploy functions from something like Docker Hub. Deploy a new function from the store: mememachine. Mememachine, like it’s name implies allows you to create a meme by supplying a URL to an image and overlays text that you provide to the function. Select mememachine from the modal window and click on deploy. Let’s make sure it works. Select mememachine from the function list. Paste the lines below into the Request body in the OpenFaaS Portal. Select Download so that the response is downloaded when the function is complete, and click on Invoke to run the function. "top": "ONE DOES NOT SIMPLY","bottom": "PLAY WITH DOCKER"
In a few seconds you should have a meme generated from the mememachine function running in OpenFaaS. Open up the downloaded image and be amazed! OpenFaaS also has a command line interface or CLI. Switch back to the Docker Playground window for Play with Docker and type the following command to install the OpenFaaS CLI. In order to create a new function first make a directory to house our functions. This isn’t completely necessary for this demo, but it will likely prove useful to get into the habit of defining and organizing your folder structure as you continue to explore OpenFaaS and create more functions. We’ll want to spit out some of System.Environment. Now, build the function and deploy to OpenFaaS with the commands below. Grafana is an open source project that provides data visualization & monitoring with support for Graphite, InfluxDB, Prometheus, and more. To install Grafana enter the command below. You should now see port 3000 is now available as a link in the top-center of the PWD page. Open Grafana by clicking on that link. Login to Grafana with the default username of admin and password of admin. You’ll need to add a data source to reference the Prometheus instance exposed by OpenFaaS. Provide a name and select the type, Prometheus. Enter the URL, the IP address of the master node, and port for Prometheus (9090 by default). Save & Test the data source. There are a few dashboards available from the community, or you can always create your own. My favorite is a dashboard created by Brian Christner, OpenFaaS Serverless Dashboard. You can install the dashboard by choosing the + sign, Create => Import. Within the Grafana.com Dashboard textbox enter 3434 (the Id for Brian’s dashboard). From the faas dropdown select “PWD”, or whatever you named your OpenFaaS/Prometheus data source. 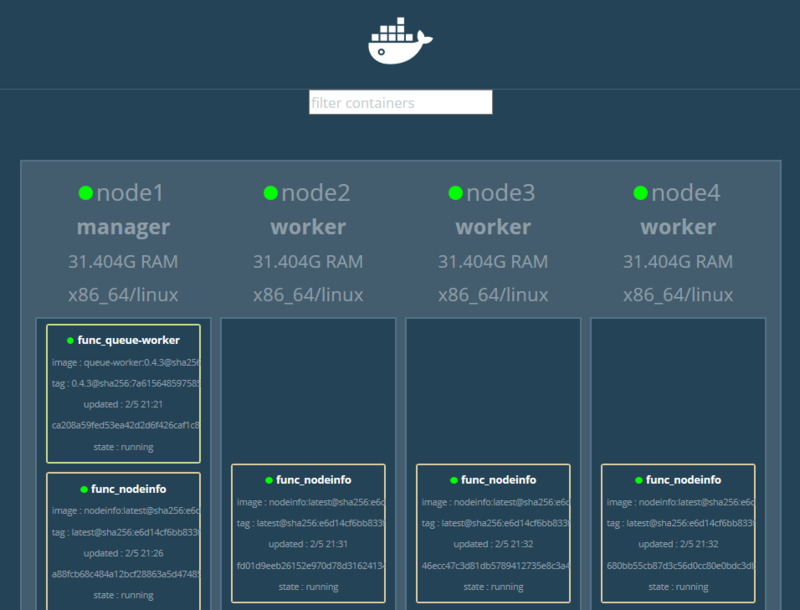 Another useful tool is the Docker Swarm Visualizer. This will allow you to keep and eye on your functions as they scale, as well as give you a visual indicator when they’re available (green dot). If you started by selecting Add new instance and did not choose 3 Managers and 2 Workers from the wrench menu you likely have only one node. Have no fear, you can always add additional nodes. Add a few more nodes by clicking on Add new instance. You’ll need to get the join token from your master node. Execute the follow command on your master node to get the token to allow additional nodes to be added to the swarm. Now, select each additional node and execute the following command, substituting your token and IP address from the results above. You now should have multiple nodes within your swarm which should appear in the Docker Swarm Visualizer. Let’s run a few scripts to execute some functions in quick succession. In order to see the your functions scale, execute the following scripts, one in each node. Open up Docker Swarm Visualizer and Grafana to keep track of the statistics. 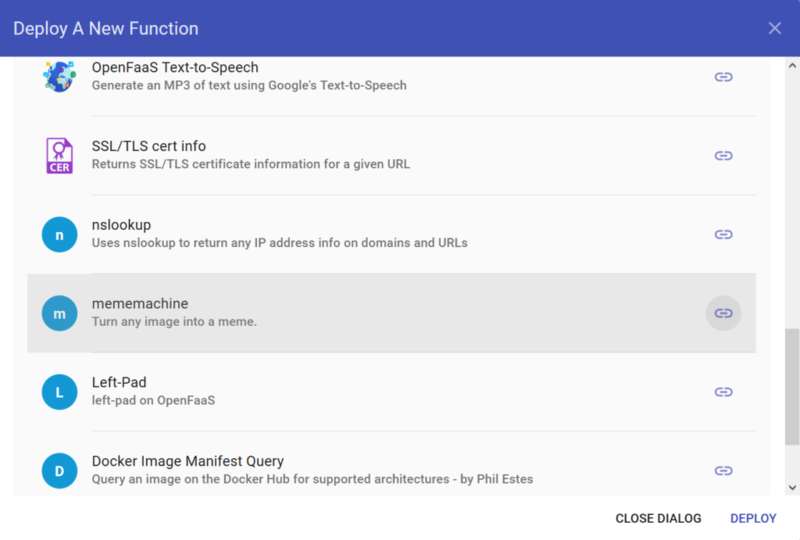 The container orchestrations, function management, and API gateway provided by OpenFaaS make it an extremely powerful tool in managing serverless functions. Let me hear from you. I would love to know more about what people are building these days! Many more resources are available from the OpenFaaS community. Read the docs, join the Slack group, and get involved by contributing on GitHub!